Simi Valley dentists, Dr. Jerrold Guss and Preferred Provider, Dr. Carmen Rahimi, are proud to offer Invisalign®, the nearly invisible, yet highly effective alternative to metal braces. This alternative to traditional braces gives patients the cosmetic benefit of clear braces while enjoying a more comfortable and oftentimes shorter treatment time. Many patients, especially adults, who have some form of malocclusion (misalignment of the teeth) are reluctant to use metal braces. And understandably so. Fortunately for adults and teens seeking to improve their smiles and their overall oral health, Invisalign® offers a convenient and age-appropriate alternative to standard metal braces. The Invisalign® process is quite simple. Your Simi Valley dentist will use a special 3D imaging technology to create a full view of your teeth, jaws and face. The resulting images will be sent to a team of dental technicians, who will then chart a treatment course. A series of “alignment trays” are then custom made to accurately fit the patient’s teeth and mouth. The patient wears the custom trays for at least 22 hours a day, except when eating, brushing or flossing. Each tray is worn for two weeks and are used in succession, bringing the patient closer and closer to the perfect smile! Your Simi Valley dentist monitors your treatment, coordinates with the Invisalign dental technicians and issues your successive Invisalign trays throughout the course of your treatment. Is It Really That Important to Have Straight Teeth? A beautifully balanced smile is certainly nice to have, but are there any other noteworthy benefits to correcting misaligned teeth? As it turns out, there are. Crowded or crooked teeth can make it very difficult to maintain proper oral hygiene. Certain tooth surfaces may prove very difficult to brush, and flossing may also be limited. Malocclusion can create safe havens for sugar-feeding bacteria and plaque and tartar build-up. The end-result is a higher risk of tooth decay and gum disease. The process of cleaning your teeth is a whole lot simpler with Invisalign® than it is with standard metal braces. Simply remove the aligner prior to eating and/or brushing and flossing and replace the cleaned trays after you’re finished. Likewise, you need not worry about any eating restrictions when using Invisalign®. 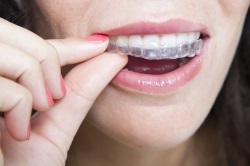 Invisalign is a true breakthrough in orthodontic care but it may not be the best treatment option for every patient. Drs. Guss and Rahimi have fitted and successfully treated several Simi Valley patients with Invisalign®. If you’re interested in finding out if Invisalign® is right for you, then we encourage you to set up a consultation with us today. Contact us to request an appointment or schedule one online.